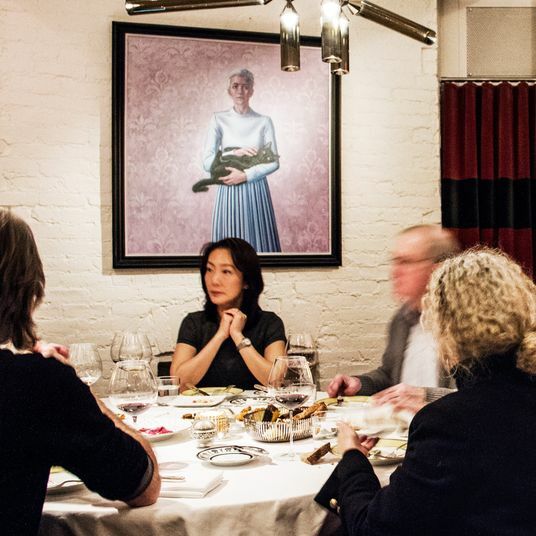 Culinary ambition in New York used to be a strictly nocturnal affair. Then came the Australians, with their brassicas bowls and sunny dispositions. 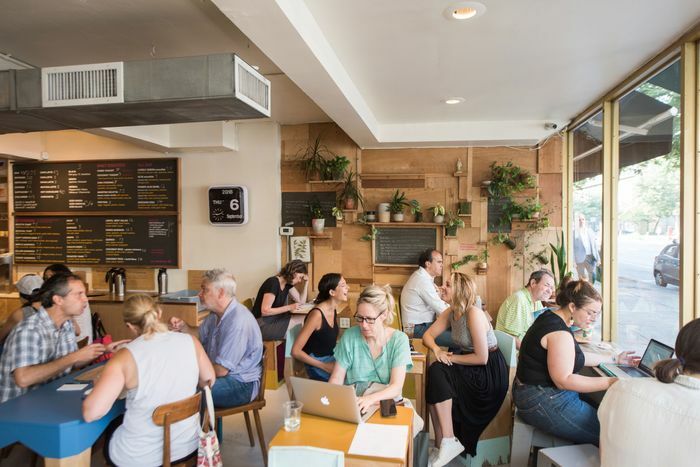 Like cane toads in Canberra, cafés that opened their doors early and kept them open late began popping up. Their coffee game was tight. Eggs were poached legit. And as rosy-fingered dawn began her journey across the sky, finally she had something good to eat. 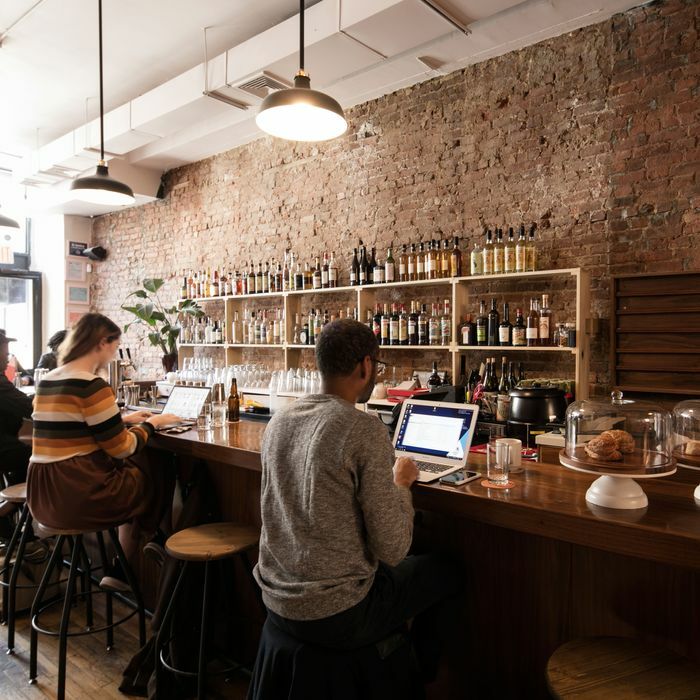 Like a good Hinge profile, what defines these all-day cafés is hard to pin down, but you feel it in your bones. It isn’t simply the common constituent elements — succulents, pastels, a menu marked by virtue, breezy yet precise branding — it’s the gestalt that’s the tell. At its best, the all-day café is the living room you’ll never have, filled with food familiar yet better than you’ll ever make and eaten by people more attractive than you’ll ever be. And perhaps most important, it’s the place that, after the plate has been cleared, you can sit still and remain in light. 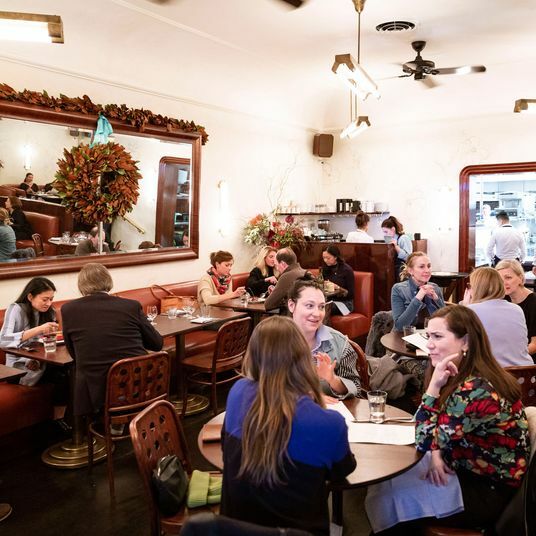 Icarian in its ambition and Promethean in its execution, Hunky Dory is the psychedelic all-day-and-into-the-night wonderland of owner Claire Sprouse and chef Kirstyn Brewer. 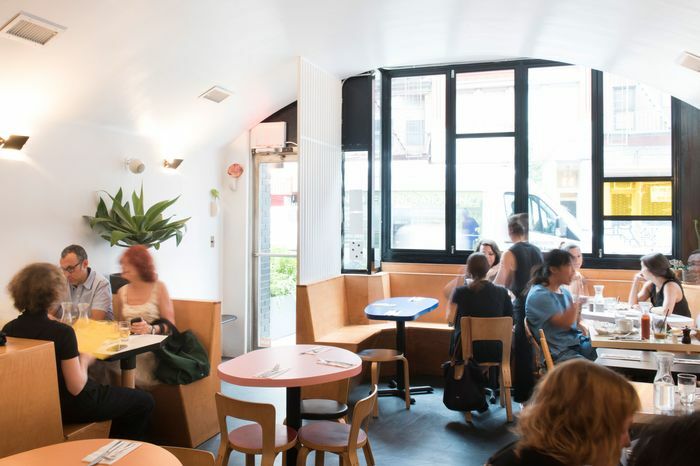 The space, skylit during the day with a warm glow after dark, has all the typical signifiers of all-day-ness, but both the cocktail and kitchen menus belie Hunky Dory’s drive. Brewer is egg’s best friend since Jacques Pepin. She boils them softly then soaks them in lapsang souchong. (“Boil me softly in lapsang …”) She coddles them and serves them in herb cream. She scrambles them and then, like a Norse warrior, sends them into the afterlife on a brioche pyre with lamb-and-pork sausage, frisée and curried onion. Savory dishes include miso-touched cod tots, a riff on croquetas de bacalao accompanied with mint (who knew? ), and an exciting “Soup!” (punctuation theirs) of pickled mussels, celery-root purée, cubes of green apple, and mustard seeds. 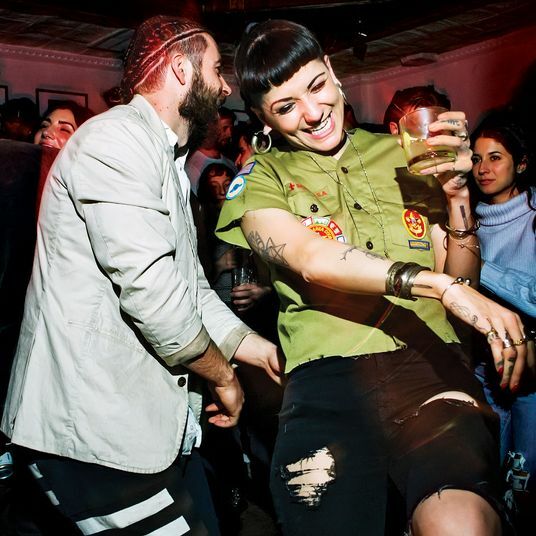 Sprouse, a Texan formerly of San Francisco’s ABV and Williamsburg’s Sunday in Brooklyn, is an avid evangelist of sustainability in spirits. The Stop and Stay uses old coffee grounds, much rum, and Amaro Averna; the Golden Year, a very good riff on a mai tai, subs out water-hogging orgeat (made with almonds) for Earth-friendly sunflower syrup. 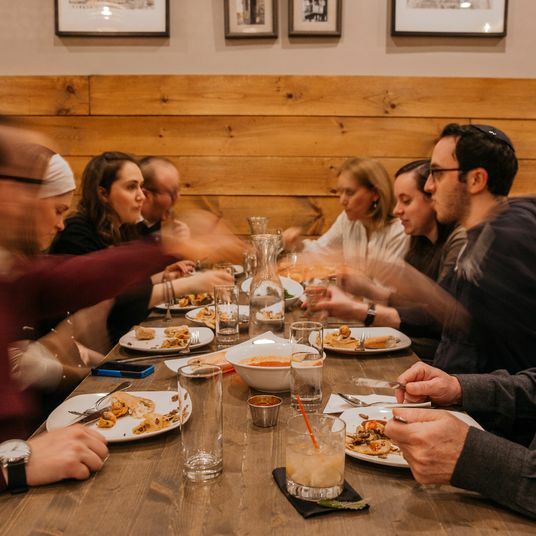 On the banks of the BQE, owner Nate Adler and chef Will Edwards, both émigrés from Andrew Tarlow’s empire, took advantage of Williamsburg’s rapidly rising condo stalactites to carve into the base of one a helluva soulful café. The space, with its cheerful art by Lea Carey, resembles an adult Montessori classroom. And just like Montessori, it’s largely DIY. 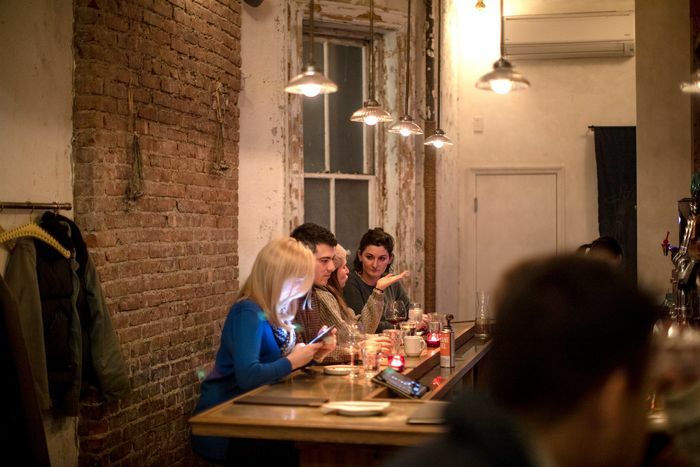 Guests order from a counter, grab a number, and find a seat at the light-wood bar or tables. There’s ample space and even a nook with books (if you like a little Rebecca Traister with your Miss Patty Reuben). Like terza rima, the three square meals of the Gertie menu interlock. Tonight’s glistening rotisserie chicken — with mustard sauce and beans — is tomorrow’s chicken salad sammy on a housemade bialy. Edwards is an excellent steward of old-school New York comfort food, fitting since Gertie is named after Mr. Adler’s Queens-bred bubbie. 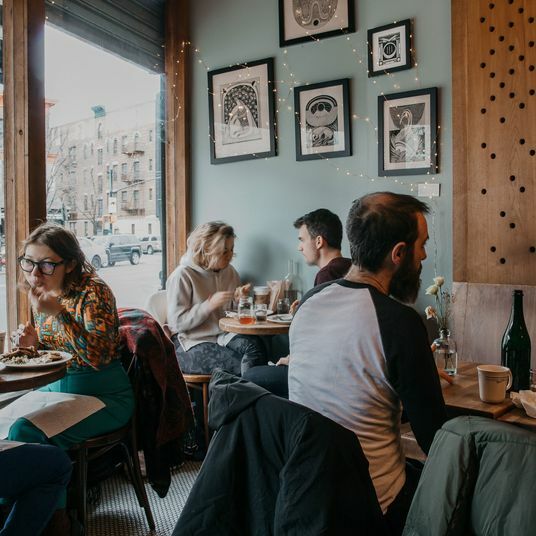 Despite the colorful interior, his smoked-fish sandwich topped with melted Cheddar or silken salmon twixt toasted bialy resurrect the black-and-white New York of Elliott Erwitt and nickel egg creams. 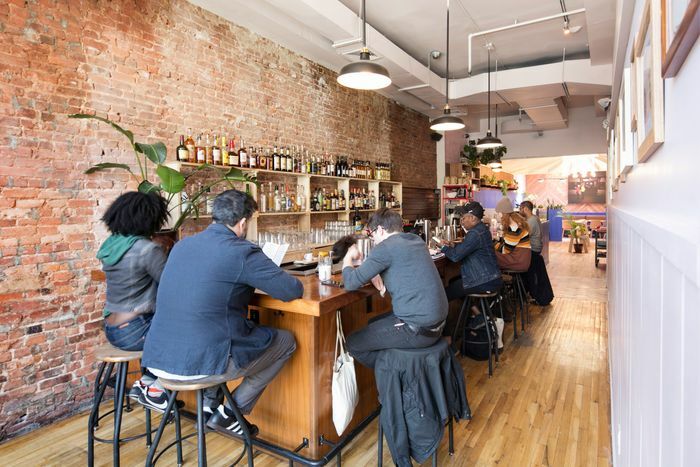 Golden is the light as the sun streams through the windows of this Bed-Stuy café, casting G-O-L-D-A in shadow upon the undulating bar, small circular tables, and potted ficus. 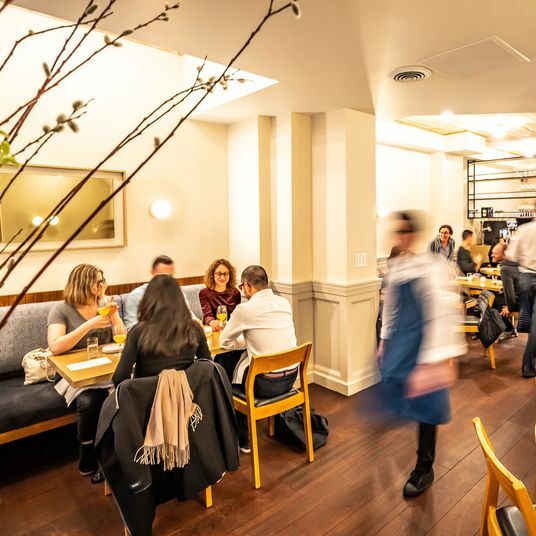 It falls on small plates of tremendous ambition and subtle Middle Eastern touches. 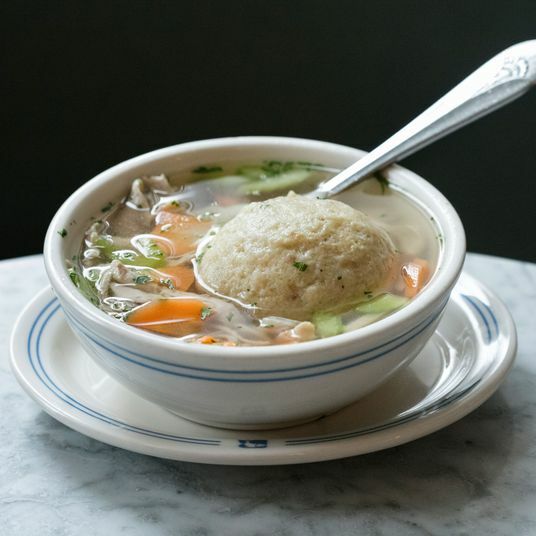 Golda is the name of the late owner Danny Nusbaum’s grandmother. 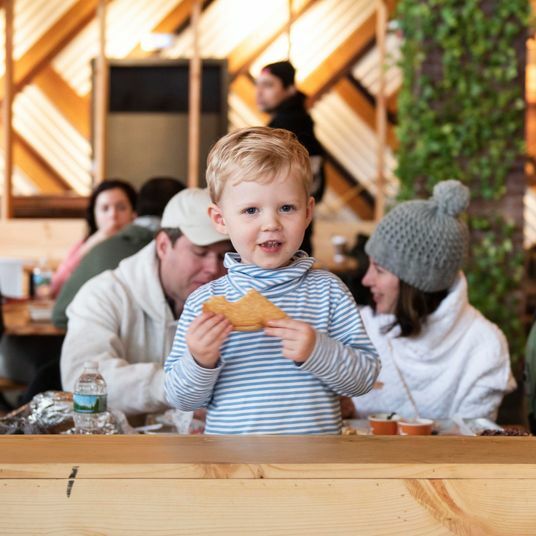 (Nusbaum came from a long line of noshers; his family runs Pick-a-Bagel, and his previous venture was the now-closed Tilda All Day.) Though the light changes as the hours march by, the menu doesn’t, and why should it? 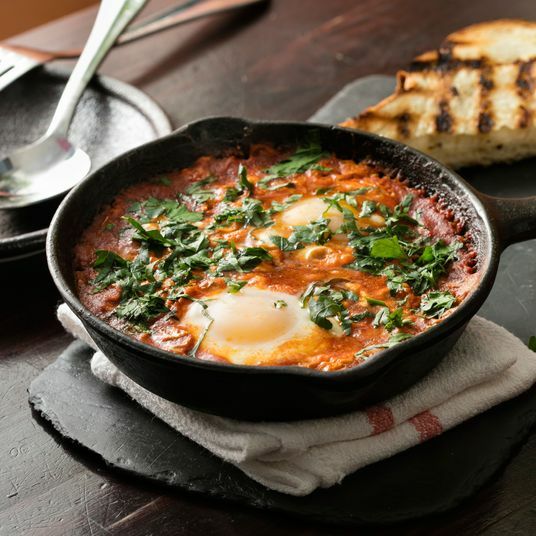 Eggplant menemen — a sort of Turkish shakshuka — is as rewarding at 3 p.m. as it is at 7 a.m. Ditto the chicken sausage, egg and cheese sandwich, whose pickled chiles are offset by a creamy cucumber yogurt called mast-o-khiar and a tranche of kashkaval, a Levantine declension of caciocavallo. 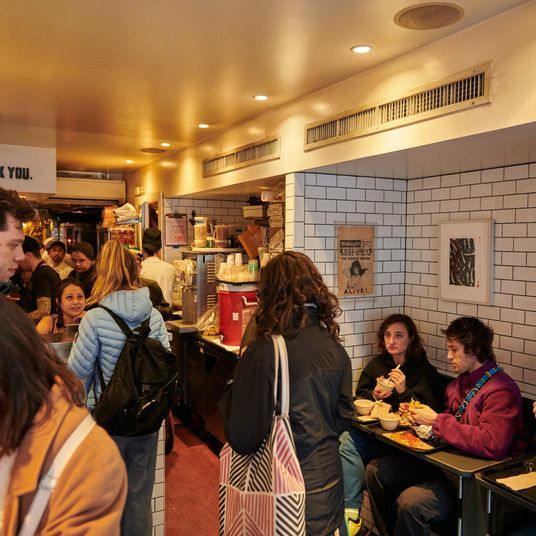 In many ways, that sandwich — simple on its face; beautiful in its body — represents all that glitters about Golda, a small space, unassuming and yet precious. 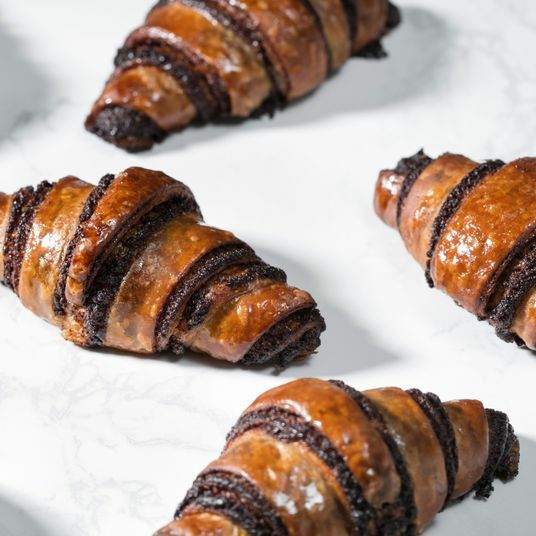 Danes, light in disposition and dark in bread, are responsible for Ole & Steen, the latest invasion of the Nordic caravan of bakeries to land in New York. At the counter, there are deep cuts from the pantheon of Danish dark breads like skagen, olander, and sourdough. Word has it that the biga (starter) for its rugbrod (rye bread) is over 150 years old. There are rare pastries like the Sarah Bernhardt, a chocolate cookie with candied violet invented by Johannes Steen in honor of the translation of her memoirs into Danish, as well as Ole & Steen’s signature Christianshavner cake, a disk of hazelnut sponge topped with strawberry mousse. 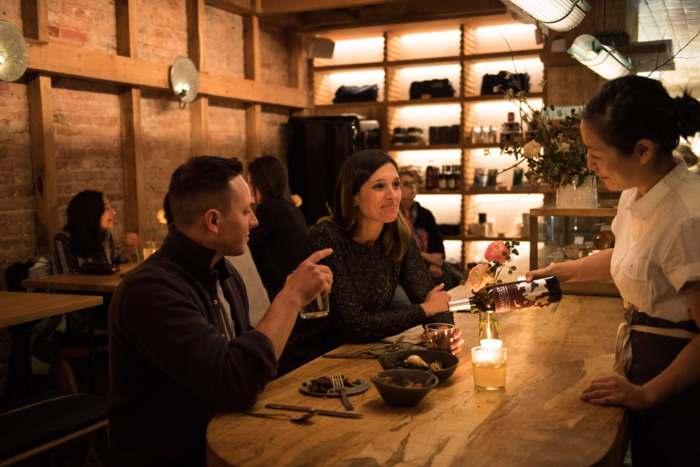 The menu includes tart skyr-yogurt bowls with New England cranberries, a vegetable-packed Brandt-beef stew, a slew of toasties on pillowy focaccia, not to mention a full complement of smørrebrød, Denmark’s open-faced sandwiches. The space is rather austere — ahem, Danish modern — but there’s ample room down the steep flight of stairs, a cavern that resembles a very well-stocked library where eating isn’t just allowed, it’s encouraged. 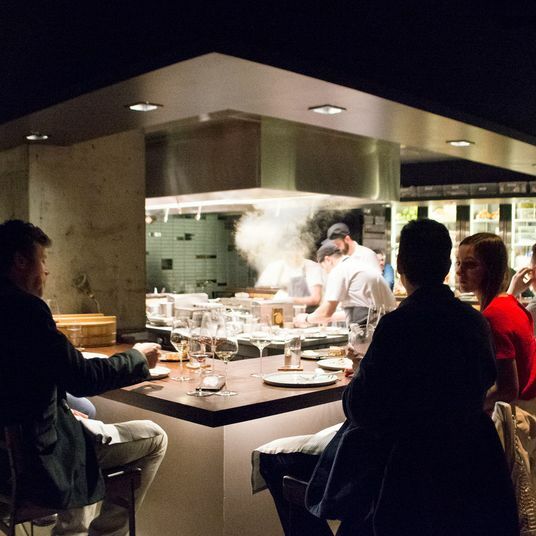 Behind a glass-walled kitchen inside a light-filled room on an industrial corridor of Kensington, chefs Björn Böttcher and Greg Barbiero are a motion blur. Both Böttcher and Barbiero arrive well before dawn to begin baking. Böttcher, a Hamburg native and former longtime pastry chef with David Bouley, stocks the counter with whatever pastries come to mind. Some days, these include cinnamon swirls called franzbrötchen from his hometown, Swedish cinnamon balls, perfectly formed marble cakes, as well as the usual suspects: small lemon-blueberry muffins so stuffed with blueberries they resemble Violet Beauregarde and surprisingly convincing everything bagels. The menu cha-chas from breakfast burritos to chicken parms, the latter accompanied by a few stellar garlicky spears of broccoli rabe. (Barbiero, a former biochemist, honed his craft at Shea Gallante’s Ciano). And the vivacious De Pioneer burger, made of aged Pat LaFrieda meat and wearing an impressive blanket of Cheddar, towers like Hudson Yards. 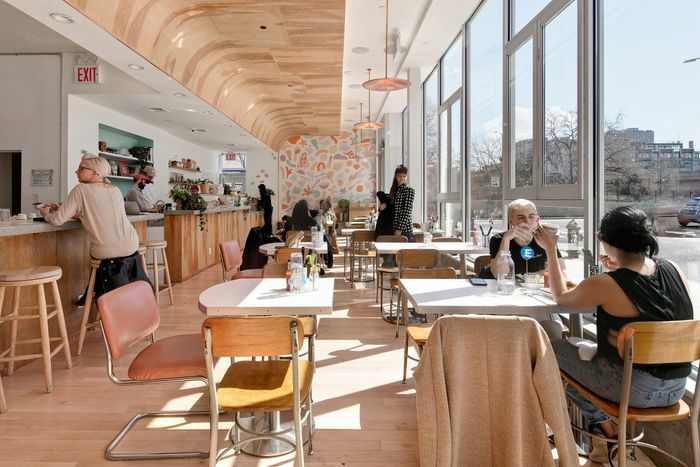 Virtue is shrouded in beauty at Camilla Marcus’s pretty-up-the-wazoo café. If, for a moment, the influencers and millennials put down the phones they so assiduously use to document their experience — #postitfortheaesthetic — they might note Marcus has pledged to donate a percentage of every purchase to the Robin Hood Foundation, or that the restaurant is zero waste or that it’s vegetarian. But damn, you can’t blame them for posting because these bowls, like the Over the Rainbowl (brown basmati rice, lentil falafel, tricolored cauliflower, kale, delicata squash, pickled beets, jalapeño tahini) are technicolor dreamboats. Of course, one can’t survive just on bowls, and for those willing to forgo the ’Gram for something more substantial, there are sandwiches including the Mushreuben (maitake masquerading as meat) and the Sunrise Kingdom, a superlative breakfast sandwich of scrambled egg, avocado, spicy shallot labneh, and pickled onions. Eight stools, three small tables, some flowers (roses, dried; hyacinths, fresh) are about all there’s space for in this sliver of a café. Yet the kitchen’s ambition spans the globe. During the day, Davelle is a coffee shop, serving Kyoto-style cold brew as well as slate-gray black-sesame kinako lattes that look like the moon from above. Breakfast and lunch are divided into toasts and bowls. The former come on airy slices of milk bread, topped with the conventional (banana and chocolate; ham and cheese; cinnamon sugar) to the unusual (stringy beads of fermented soybeans called natto on melted mozzarella; curry cheese). 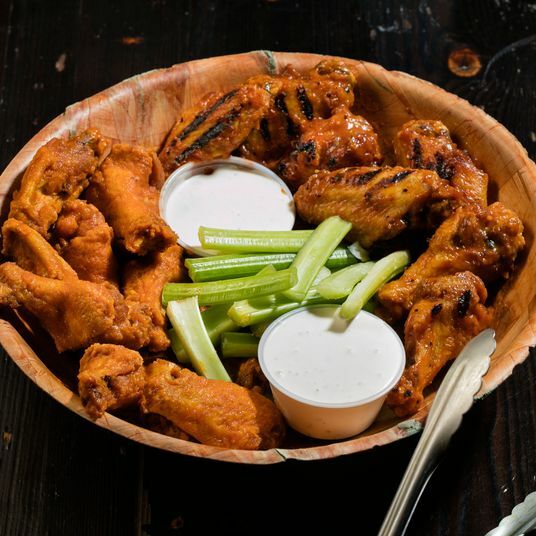 Inside the bowls are a rogue’s gallery of precisely flavored offerings. 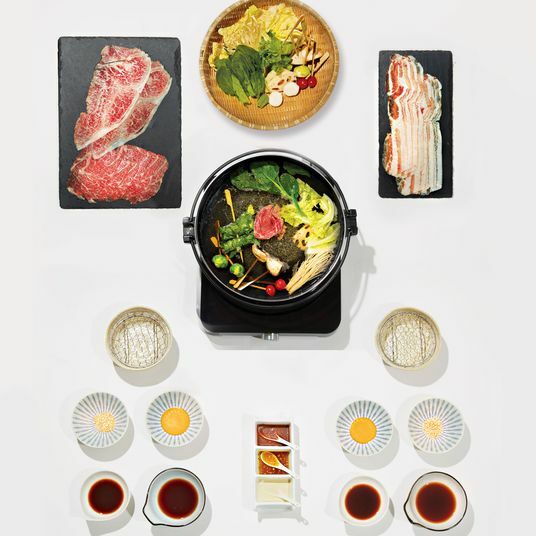 Kanayama is famous for the curry bowl, which comes with chicken katsu or sans, and the pastas, including a bracingly oceanic mentai spaghetti with cod roe, perhaps the best loco moco in New York (weird, right? ), and the by-now-famous uni spaghetti, in which bright tongues of sea urchin battle with the pasta for primacy. 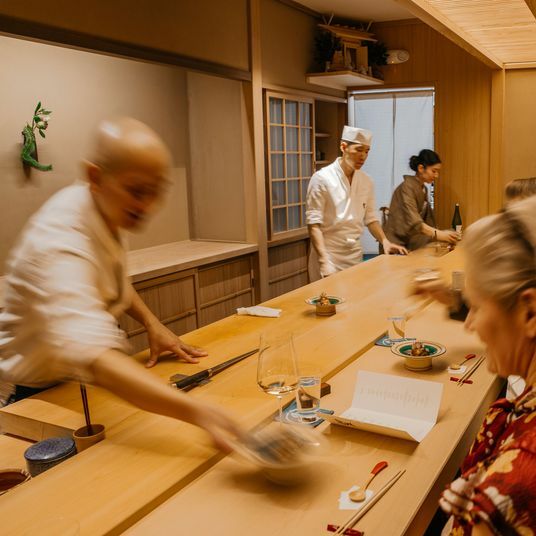 At night, Davelle transforms from kissaten (coffee shop) to an izakaya (pub) with an even more obsessively curated menu with a few expanded options. The açai is cold and purple and flown in from Brazil. The waiter has a mullet. The porridge is African millet, and the tables at Dimes are brightly colored and forever occupied. 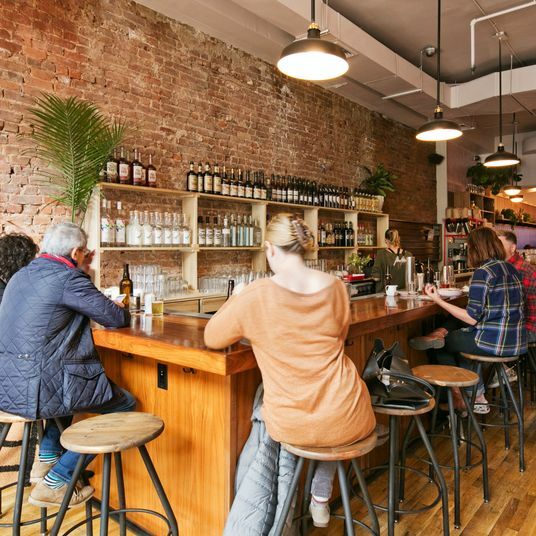 Since co-owners Sabrina De Sousa and Alissa Wagner opened it in 2015, Dimes has been a little portal to an alien world where everything works better together. Here, the lissome eat some toothsome tacos, toast with tahini, and pulled pork with pineapple. 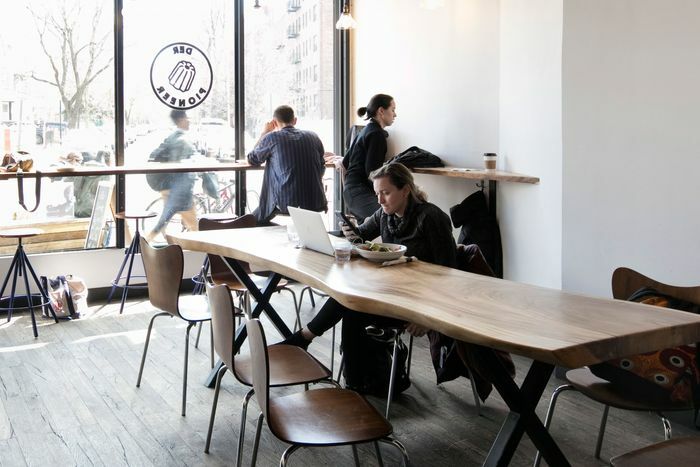 Here, health runs contiguous with delight from said açai bowl, piled high with raspberries, to the Dimes Caesar, to the fearsomely fiery BLT (thanks to pickled jalapeño peppers) and, at dinner, a menu nearly as adventurous as the customers’ avant-garde fashion sense. 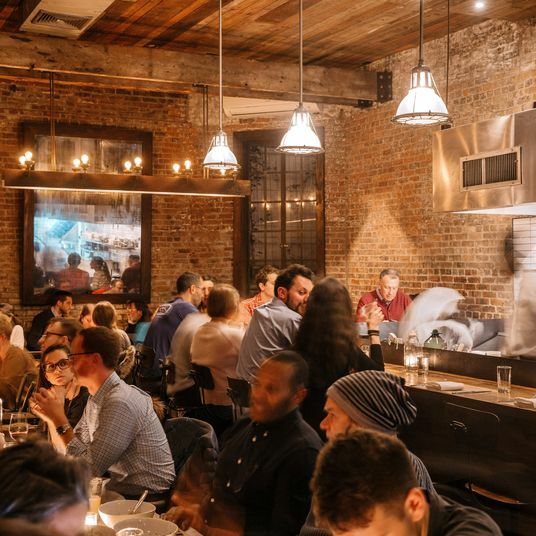 Everything from green pozole to scallops with Sichuan peppercorns and a turmeric-touched shrimp and grits. Never mind the strollers that clog the front half of this coffee roaster like a breeder logjam. (I kid. I kid.) Cobble Hill cognoscenti journey to the back of East One Coffee Roasters, where chef Will Ono, an alum of noma, Mugaritz and Chez Moi, consistently sends out plates much better than they need to be. Technically called the Eatery at East One (though a more clever mind might have dubbed it Eat One), it has Nordic and English touches by Ono added to a sturdy cast of usual suspects. Duck-leg hash is accompanied by roast green peppers and two fried eggs; a Brooklyn Fry Up has all the meats, plus that weird roasted tomato that appeals only to the English. For lunch, Ono delivers on a lineup of solid sandwiches, an extremely messy and delicious cheeseburger (Painted Hills Farm beef, American cheese, and a tangy special sauce), and even an octopus salad so charred and delicious one can almost forget that it’s made from humorous creatures of exceeding intelligence. 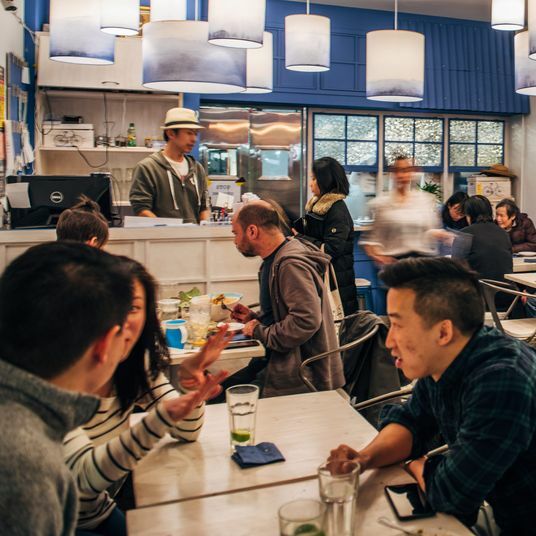 Opened in 2003, Ruby’s is one of the frequently overlooked progenitors of the modern all-day café. It was my first real exposure to Australian wait-service with its friendly demeanor and non-rhotic accent. But so, so charming. Ruby’s found renown for its Aussie-style cheeseburgers, which, like Aussie Rules football, are a heartier, more OTT version of the staple. (The Whaleys, for instance, comes with tomato, lettuce, beet, pineapple, and a fried egg). 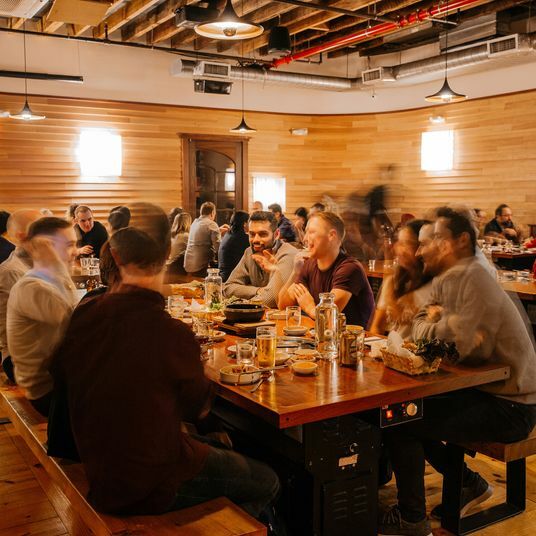 The salads, including the roasted pumpkin with spinach and a tar-colored pomegranate vinaigrette, and the pastas, among them a very good al dente rigatoni with sausage and baby peas, earned a steady crush of patrons. By the time Instagram hit in 2010, it was already fuxin with avo toast and green egg bowls (that’s scrambled eggs, kale, spinach, avocado, and salsa verde) for seven years. Another early Antipodean entry into the genre, Two Hands traffics in Aussie rococo burgers — so juicy you need, yes, two hands to eat them — as well as handsome brassicas bowls, swooshed with hummus and full of kale; clouds of scrambled eggs whose creaminess is punctured by pickled chiles and, of course, a surfeit of avocado. 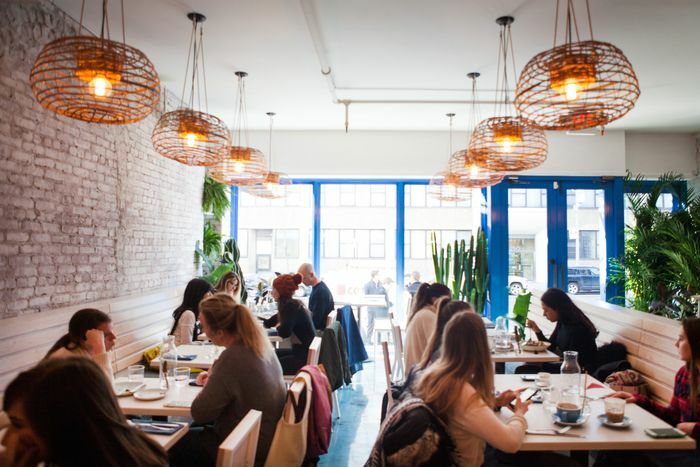 What started as a more modest café in Nolita has expanded to a full-on restaurant in Tribeca. Both locations are full of beautiful people who, in one way or another, seem like influencers. Turnover is high, and lingering is discouraged. But one is pushed out with such an open friendliness, the heave-ho isn’t apparent until you’re standing outside, hands full of laptop and belly full of brassicas. 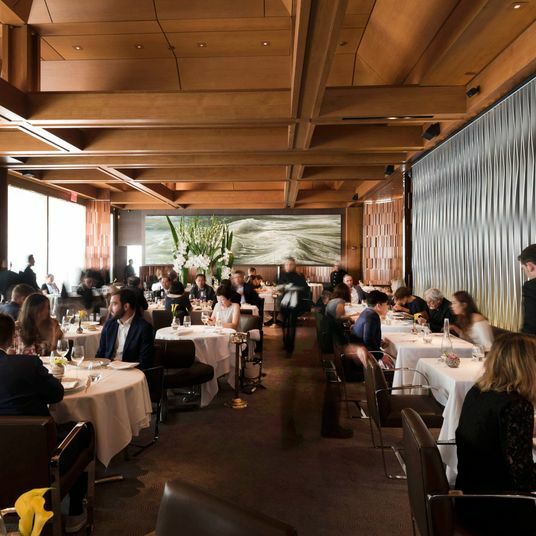 As one might expect from a Danny Meyer joint, Daily Provisions exudes professional ease at every hour from every angle. 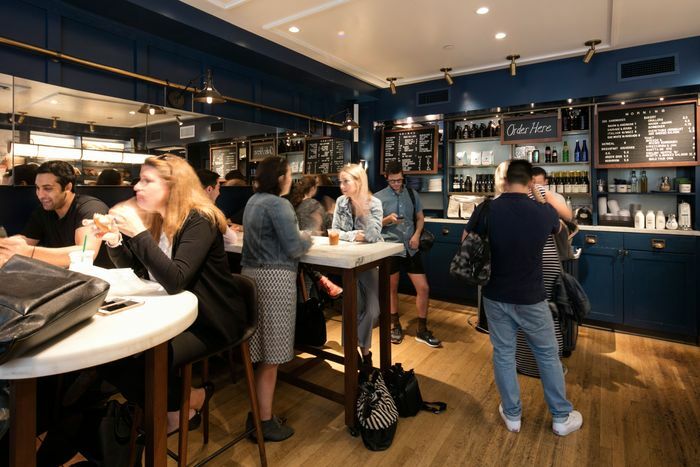 In the morning, the small sunny space, adjacent to Meyer’s Union Square Cafe, traffics in best-in-show breakfast sandwiches — for carnivores, there is no better bacon than the thick Berkshire that dominates the standard B.E.C. — cinnamon crullers (like a doughnut but groovy), and the requisite avocado toast. At lunch, a brisk trade in priority-lane sandwiches — you know, the kind that get you to the same place but with a slightly better boarding experience — include a ham-and-cheese (peach mustard! Brie butter!) and a crispy chicken Milanese. Dinner is devoted to the rotisserie, an affordable and low-labor way to turn chickens golden, fat rendered and diners sated. 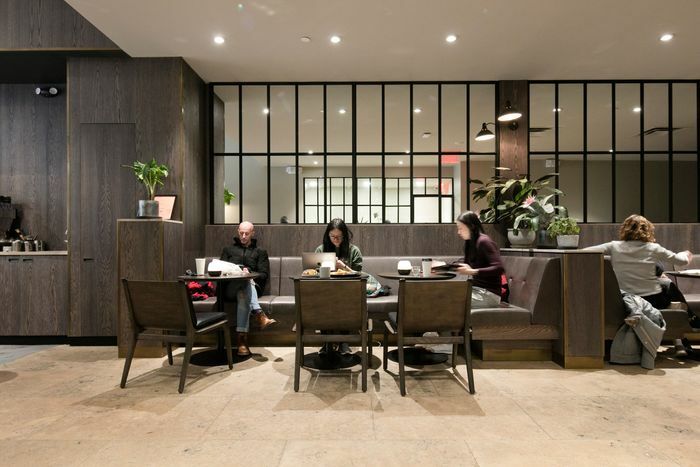 OCAFE, a plant-filled embassy of Brazil in Greenwich Village, is the passion project of Fernando Aciar, an Argentine who trained under Francis Mallman as well as Alice Waters. Aciar has a keen material eye for things edible and non-. The plates and cups are all wrought by his hand. They are uneven, unique, and rich with wabi-sabi. The pão de queijo — Brazilian cheese puffs and perhaps the greatest contribution of that country since Paulo Freire’s Pedagogy of the Oppressed — are perfect, compulsively biteable, gooey, and gluten-free. The menu is as compact as the space yet full of simple sandwiches well done, like the Simple Sandwich — Cheddar, cucumber, herbed butter — to slightly more involved bowls full of market veggies.